Truth can be manipulated be the image. You see it all the time. As easy as it is to document an event, a photograph can also misrepresent reality. While photoshop post-production – cropping, cloning, cutting out – is the most obvious form of manipulation, there are huge ethical issues in what photographers show or do not show in an image. These include whether the image maker presents a scene with exaggerated aesthetics (the dreamy beach paradise image which omits the six-storey apartment blocks) or if their desire to present the unusual neglects the mundane reality. What I’m trying to say is that the photo which holds your gaze is not always a representation of the truth. For every image you get to see in a newspaper, magazine, book or on the internet, there are hundreds from the same set which will never see the light of day. I’ve had a couple of weeks off work. But being a photographer means you don’t put the camera down when you go on holiday. 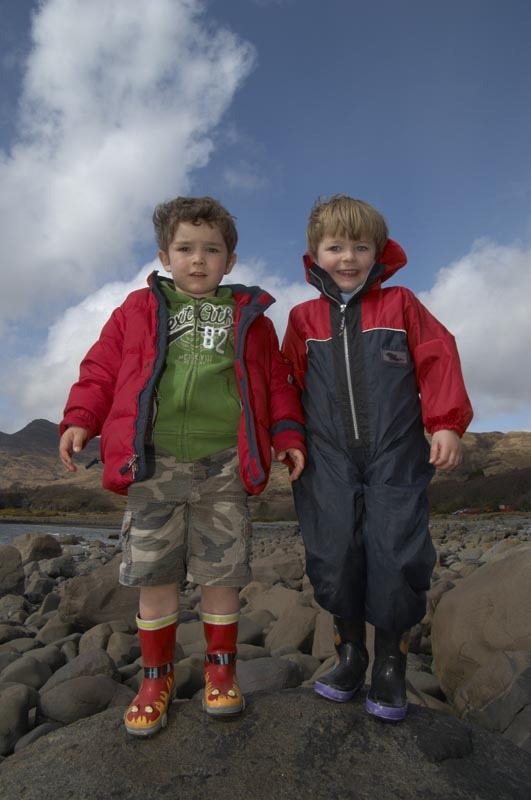 On the Isle of Mull most of my camera clickety-clacking concentrated on my four-year-old son Teddy and his friend Seamus, also four. And here’s the thing. Persuading them to pose for a photograph or capturing them running around enjoying themselves was satisfying – but these images are not entirely truthful. The joy of capturing them in happy mode was too often matched by the despair of their whinging, bickering and general stress-inducing behaviour. A week on the Isle of Mull with Anna and two kids was brilliant. But these images only tell half the story. *NOTE: The sound on this video may cause discomfort to your ears.